As young children, Nine’s would deal with conflict in their environment by withdrawing and not adding to the trouble. They learned that if they were undemanding and had few expectations, that they could protect themselves and keep the family more calm. Nine’s have that effect on people they encounter – they hold a sense of easy goingness, non-demanding, non-judging which endears them to others. We feel safe around them. They see the potential in others as the Two’s can do, and really encourage others to go ahead and try to fulfill their dream. With this focus on keeping everyone else in a good place, Nine’s can lose touch with their own inner voice and not be able to decide what to do next for themselves. As the centre of the Instinctive Triad or the Gut Centre, Nine’s work is to wake up to their own passion, drive and power. They do not always see the difference that they make in the world and seem to accept that that’s just the way life is. Wonderful procrastinators – they can always find reasons to avoid doing something they are just not sure they are ready to tackle. We say, Nine’s will never do something they don’t want to do however they will not tell you no. It just won’t happen. They have a bit of a stubborn streak to those who know them. I have a Type Nine friend who is a genius in her craft and as a teacher will make it all look easy. She will say “if I can do it, anyone can do it!”, which puts everyone at ease and ready to jump in and try. Nine’s at their best in a relationship are kind, gentle, reassuring, supportive, loyal and non-judgmental. Nines at their worst in a relationship are stubborn, passive-aggressive, unassertive, overly accommodating and defensive. Take regular exercise that gets the heartbeat going and amps the energy. Practice asking clearly for what you want in relationships. If you find yourself saying, “I don’t know,” or “Okay, whatever…” pay attention. Instead tell them you will let them know when you decide, that you need time to think. 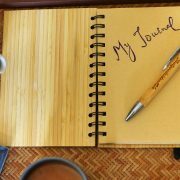 Start a daily journal. Every day write down , “I am angry about…” at least three times and learn to acknowledge this emotion in your life. Make daily realistic lists of what you want to accomplish and stick to them. If you go to the fridge between meals, ask what uncomfortable thing you are avoiding. Learn to include your opinion in a group by asking your higher self what it wants, as if it were another equally valid member, and verbalize it. Exert yourself. Force yourself to pay attention to what is going on. Do not drift off or tune out people or daydream. Work on focusing your attention to become an active participant in the world around you. Try to become more mentally and emotionally engaged. It is worth examining your type’s tendency to go along with others, doing what they want to keep the peace and be nice. Will constantly acquiescing to the wishes of others provide the kind of relationships that will really satisfy you? Remember, it is impossible to love others if you are not truly present to them. This means that you have to be yourself, that you (paradoxically) have to be independent so that you can really be there for others when they need you. How about you? Do you think you are a Type Nine? I love getting feedback. And here on the blog, you get commentluv. This is a plug-in that allows you to leave a link back to your own site when you leave a comment. Hi Jill – your comments mean alot to me. As you know, this system has provided so many insights for me and my family that I am not sure how anyone works without it. I appreciate you sharing with others so that one day we might all understand our unique views of the world and be accepting of ourselves and others! It all starts with us. Finally, I’ve reached the post about the type of 9!! As a person who are in type 9, I have to admit that I’ve been avoiding all the conflicts hoping everything is going to be in peace if I do not express ot ask what I want . I do really hate to see all arguments which happen around my family and friends. So I decided not to cause any trouble. Encouraging and Caring other people are my strengths that I can do my best to others. But the thing is that sometimes I feel lost. It seems like I made a safe line between myself and others and leave in there praying this boundary keeps the peace safe. So somtimes every relationship that I’m in means not truthful to me. Because I hide how I really feel and what I really want. 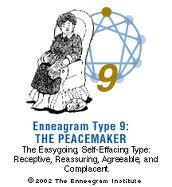 I believe through The Enneagram everyone can find the virtue which is inside of them, and get close to the Essential with it! I’m also sure that these posts will very helpful to people who are interested in developing themselves. Well Ji, what an honest reflection…that says a lot about how you understand yourself which means you are not stuck. You can choose in every moment how you want to be and how you want your relationships to be. Take time to decide how real you want your relationships and then take one step at a time to bring the courage to express your true self. You will feel freedom after the fear and others will get to know the real you. Good luck and stay in touch. I am happy to answer specific questions to the best of my ability. When I read the 9 post, I also thought – Oh good, finally my #! Thanks for all of the insights and information. I love being a 9!!! Hey Moira – and we love that you love being a 9!! We all need to be in love with ourselves because it is the only way to experience true love in the world. We start with self. Thanks for being YOU! Hi Karen, had to smile when I read this type. So true that we all have a bit of each type but when I read about the 9, it’s a “Bingo!”. Thanks, Karen for posting the types and making them so easy to understand. Hi Violet – I love the way you expressed this because that is definitely one of the ways we know there is a true connection. Another way is to feel exposed and a bit uncomfortable so I am glad that it was a “smile” connection for you. I appreciate your feedback. Thank you for sharing your Enneagram insight. I’m having trouble recognizing the finer points of distinction between the 7 and 9, since each is very dreamy/idealistic, and I think the healthy 9 integrating to 3 could look a lot like the 7. Also both tend to be happy people. What are the key differences? Hey Karen – I have heard of numerous people over the the years who can not wear a watch or influence certain electronics. I am not sure that they were to the extend that you speak of here, that’s a challenge! Thanks for adding to the conversation – see you soon! Hi Victoria – yes, the 2’s, 7’s and 9’s can have look alike qualities as they are all the adaptable types and wish for harmony and to have people happy around them. The biggest differences to identify between a type 7 and 9 is firstly the energy difference in the persona and body. Remember communication is 56% body language. The 9s display a very consistent even pace and rhythm, typically relaxed and they like to be comfortable. This shows up in their clothing style, material surroundings etc. as they are very kinesthetic in nature. Type 7’s have a much higher energy level and are constantly thinking of the future, the plans, options and possibilities. They typically have many activities planned and will move from one event to the next very easily. Transitions are more difficult for Type 9. The determining factor on what to do or not to do for 7’s is – is it going to be fun! Look at the real life representatives that I highlight for each of the types and see if that paints a better character picture for you. Have fun! Thanks for your really helpful comments, which I wish I could instantly digest and do something about! Would be interested in your thoughts on type 9s identifying their passion which I know is a problem for them. Hey Nick – I am going to send your request out to my group of Type Nines and see what responses they have to bring some real wisdom to the table. My initial advise would be to pay attention to what spurs emotion in you such as animals, the environement, fishing, reading etc. If you did not have to work, what would you spend your time doing? That could give you clues to your own passions. I’ll keep your note handy here and send a request out now to others for input. Stay tuned…. Hello to my wonderful Type Nine’s – as you see below, I have had a request from a reader to my blog regarding how to find your passion as a type nine. Can you give me any suggestions to bring forth on my site for this. I do not need to have your names present, just the comments. I answered Nick to the best of my ability and said I would check in with my expert panel!!! That’s you! Thank you for sharing your perspective on this post Olga. I often hear other type nine’s comment that they do not know what they are passionate about however they have many likes! As you do not tend to express emotions in an extreme way and passion sounds Big, I wonder if some of the likes would really qualify as something you are passionate about if you gave yourself permission to explore them more. Just a thought. Feel free to come back here in the future and add more insights. I’m a Type 9w1 and I have the same ‘problem’ Olga has – my friends’ interests hook me ‘for a while’ . They continue on to make a career of it, and I drift off. The only thing I seem to be passionate about is the spiritual dimension of life – and that doesn’t necessarily ‘show’ to other people, except when I dress up in a sari or something! And although I have ‘worked’ in the field, it’s always part-time. Oh, how did I find it – that is the question – well, I noticed that this is a constant in my life, doing various kinds of spiritual ‘practices’ – even taking walks or singing – makes me feel more connected with myself and with the cosmos – and that’s how I want to feel! That is my passion! Voila! Hi Kas – there is no race to the finish line, it is exactly as you express – a Voila! Knowing how you want to feel and noticing what activities bring you there…it is presence and awareness and patience. Thank you for sharing your discovery that has been a constant for a long time. Enjoy exploring your spiritual practise passion.